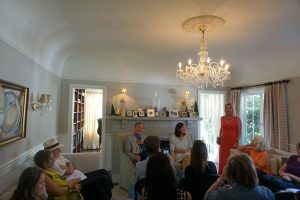 In the beautiful home of Blas Falconer, the inaugural Los Angeles Review Literary Salon took place. It was one of those startlingly unique Sunday afternoons. From the decor of the house, it was clear the hosts had great taste. The salon exemplified this. The salon was hosted by Vandana Khanna and Blas Falconer, the editors of the Poetry section for the Los Angeles Review, a semi-annual literary journal established in 2003, that voices the multitude of cultures in this city. 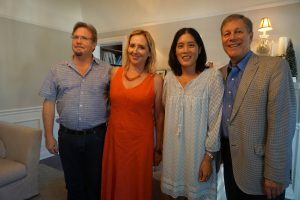 Dana Gioia, the Poet Laureate of California who teaches at USC, and Victoria Chang, award winning poet published my McSweeney’s and Copper Canyon Press who teaches at Chapman, read for us. They were inspiring. 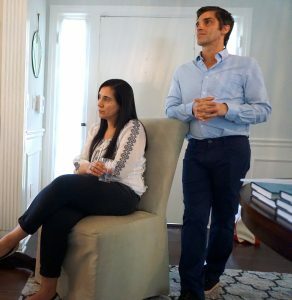 Their biographical similarity – they both graduated from the Stanford Business School and they both worked in corporate America while being poets – was an interesting discussion point. They both had to hide their ‘poetic’ side from their coworkers. 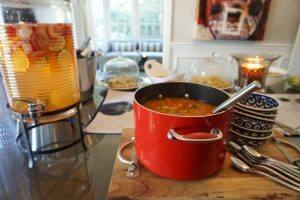 We ate delicious homemade Thai food, sipped mimosas, and introduced ourselves to the other guests before sitting down to listen. Chang’s ability to capture the essence of her soul in words and the difficulties she has faced in life made me emotional. “I thought that my life was a mess, but I realized that’s just life all the time.” She read poems about nursing her aging parents, and intimate poems she never planned to publish, that will be published in Barbie Chang (Copper Canyon Press, 2018). It was moving. Then Dana Gioia read. His use of different voices, gestures, and other characterizations brought his poems to life. He read a poem by the Scottish poet Edith Sitwell, and his accent was believable. His poem, “Pity the Beautiful,” was funny, but true. His poem, “Majority” about his child who died at four months old was painfully beautiful. My grandparents also lost a child, and through his poem I was able to understand a tiny bit more how they have been affected by it. We moved into the questions phase. In the cozy living room, it was a relaxed and open atmosphere. The conversation enveloped the room. Kate Gale, managing editor of Red Hen and poet, led the discussion. She asked Dana Gioia what he thought about technology. Gioia said that for an artist, it is important to be alone and think. He said, his students, 18 to 21 year olds, are so wrapped up in their phones that they don’t even look around to admire the sexual bodies around them. He thinks that millennials are too distracted, they don’t hear the silence enough. Silence is important to develop fully as an adult. Another blow to my millennial generation, and yet I agree with him. Victoria Chang discussed how she had two different lives, one in corporate America and one in the poetry world. “At Stanford, I was one of the few people there whose main goal in life wasn’t to make as much money as possible.” Now with social media, it is even harder to have two separate lives. She talked about how she wrote a whole children’s book in the car. It’s one of her favorite places to write. The back and forth was thrilling, my ears prickled with poems. One woman was even inspired to write her first poem since college. It was a wonderful Sunday afternoon filled with the soft spatter of poetry. Our bodies tingled with the meaning and the delicate balance of our senses. I hope there will be many more literary salons hosted by the Los Angeles Review and Red Hen Press.